Cadbury Marvellous Creations Milk Chocolate Bar 47g - this will waken up her taste buds! 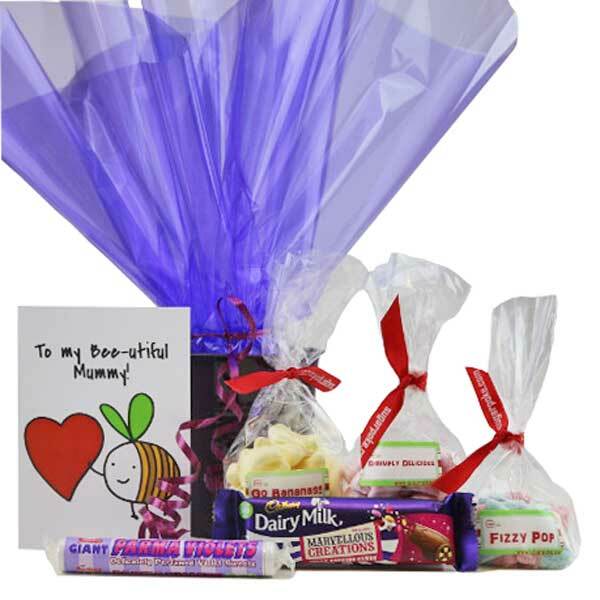 Mini explosions of pure delight with Cadbury's finest milk chocolate laced with squishy fruit jellies, fabulous popping candy and crunchy candy shells. A marvellous creation indeed! A tube of Swizzels Giant Parma Violets 40g - who can resist these fellas! Proper retro sweeties that will take her back to the good old days in no time! Presented in a gorgeous zinc keepsake 'bucket' that can be re-used in the kitchen or garden. Wrapped in a funky cello wrap, you can't fail to impress with this cute gift. Why not send this to your mum, step mum, aunt, grandma and/or anyone else who is just like a mum to you! They'll love you for it!